Business cards, despite the advent of the internet and technology, hold vital importance. They create an opportunity for businessmen to grow their network and expand their business to increase its profitability. Business owners, potential & existing clients receive a number of business cards every day. However, only those cards grab their attention that are creatively designed and printed. The rest of them keep lying in their drawers or make way to the dustbins. Thus, it can be safely concluded for a business card to serve its purpose, it must be made from top-quality material and boast of an appealing designing. Custom printing with coloured edges is in the trend these days. They allow you to add a distinct touch to their business cards and leave a lasting impression on the recipient. 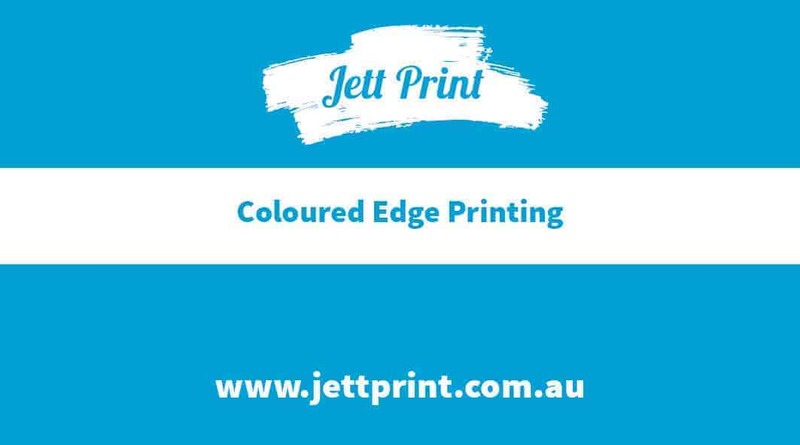 If you are looking for the premium quality custom printing with coloured edges for business cards or other types of documents in Australia, Jett Print is there at your service. 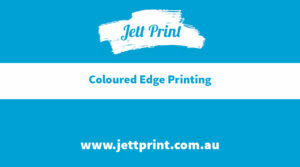 We excel in providing top-notch custom printing services with coloured edges. By using state of the art technology, we create high-quality custom prints that have appealing coloured edges. These prints can be ordered in a variety of sizes and designs. For the convenience of our customers, we offer online order placement facility. You can also request a sample pack to get an idea of prints they will get. In addition to that, we offer our customers free delivery services across Australia. By utilising our printing services, you can get your documents, cards, pads etc. printed with coloured edges at the most affordable rates. Call us now to know more about our printing services.